I just saw a link to a story called “Left Brain Grocery List,” and I sat here and laughed out loud while I’ve listened. It reminds me so much of the stories I have heard living here in the South.The woman who’s speaking is named Jeanne Robertson. Lights … Cameras … Insect Repellent? How To Build Your Own Outdoor Movie TheaterStep by step tutorial. He says it cost him less than $250. Introducing Blue Finch Studio's first YOUprint card. YOUprint is interchangeable with the term "printables". A printable is a PDF file that you print at home on paper, card stock or a sticker sheet to make what YOU want, when YOU want. Let the Summer Grilling Begin! Check out Mary Hunt's awesome grilling recipes, including a recipe for hamburger buns! If you’re tired all the time, a change in what you eat (diet) or what you do all day (activity pattern) may be all you need to turn things around 180°.You won’t be able to do everything on this list all the time — you’d tire yourself out trying to get more energy — but do try them all to see which ones work for you and your schedule. Add a few of these tips to your regular routine. Or mix them up to keep things interesting. Favorite Things Giveaway offers up a feminine, romantic, lovingly hand-crafted "Dream Bird" necklace from Lindsay at Bella Cene'! Day 6 of the Favorite Things Giveaway Event keeps the modest clothing coming thanks to Mia Bellina! Mia Bellina offers lovely tops and brilliant basics to make sure your wardrobe is modest and stylin'! Their line of "Sonatas" is the perfect solution to put under tops that are just too low to wear without a cami, but they stop right under the bust so they don't add bulk to your midsection! These items would be perfect for under dresses to avoid the "ride-up" that I'm sure you've all experienced with traditional camis. Check out the full details at The Faithful Fashionista. Many a parent has ordered something off the kids' menu just to see their picky eater barely touch it. Why make dining out any pricier it already is? Go where the kids eat free! Make any page on your website Printer Friendly. "Save Money and the Environment"
Do your own prep work.“People pay more for prewashed greens and mini peeled carrots,” says Jim Iovine, owner of Iovine's Produce at Philadelphia's Reading Terminal Market. The additional processing―rinsing leafy greens to remove dirt or whittling regular carrots down to “baby” size―adds to the items’ expense. You can also save by skipping precut vegetables and chopping your own. Choose items with the lowest costs per serving.The USDA tracks average costs of fresh, frozen, and canned produce. Melons, peaches, bananas, and papayas are among the least expensive fresh fruits per serving. Fresh vegetables with a low cost per serving include potatoes, radishes, Romaine lettuce, mustard greens, and broccoli. Most people’s feelings after moving are “I hope we live here for a long time. I don’t want to move again.” I’ve been through chaotic, last-minute moves, a few crazy DIY moves, and some that weren’t so bad. When we moved to a new apartment recently, it was our best move yet. We even had our entire apartment unpacked just two days later.Moving can be really difficult, but there are a few things you can do to make it easier.Check out the full article at Small Notebook. Check out the Faithful Fashionista. Are you guilty of hanging on to things that you don’t use because of the belief that you “might need it someday?”It’s a common problem that leaves people dealing with a bunch of clutter. Southern Style Strawberry Cake1 (18.5 ounce) box white cake mix (without pudding)1 (3 ounce) package strawberry jello1 Tablespoon self rising flour4 teaspoons granulated sugar3/4 cup vegetable oil4 eggs1/2 cup water1/3 cup fresh strawberries, finely diced.Preheat the oven to 350 degrees F. Combine cake mix, Jello, flour and sugar in a large bowl. Mix well. Add the water and strawberries and mix well. Divide the batter evenly into three 8-inch round baking pans that have been oiled and floured. In this thought-provoking post over at Faith and Family Live, Danielle asks “How much do you spend on groceries?” After adding my own thoughts and comparing my spending to that of other families, it hit me.Check out this post over at The Finer things in Life. Something Down The Drain? Retrieve it Without a Wrench. From Family Hack. . .an awesome site! Our 1-minute video shows you how to easily retrieve anything that went down the drain…without a pipe wrench or a plumber. Check out this article over at Frugal Dad. . .
“I’m bored!” It’s the two words every parents dread as school lets out for summer. Fear not; I’ve put together two weeks worth of fun summer activities to keep kids busy, and parents sane.The list of summer activities ranges in cost from free to frugal, but each requires extra quality time with kids - something we can all afford to spend more on! Thanks to Nicole's Nickels for the linky love to FREE (yes, you heard correctly!) FREE Cookbooks! The two-week dinner plan contains quick, delicious recipes your family will love. With great savings and an incredible selection, Sam's Club is ideal for all your grocery shopping needs! Save extra time with Click 'N Pull to have the ingredients waiting for you on your next visit. Fun Fun Fun! Get Ideas for Summertime Fun with inexpensive ways to entertain your preschoolers this summer.Click here for more. Nichole is giving away a Keurig Platinum Brewer. Check it out Nicole's post here. Click here for our local Angel Food Menu. The cutoff date is Saturday, June 13 and pick up is Saturday, June 20. If you happen to live in the Raleigh, NC area, there is a pretty cool resource located here. Simply put, it is a pretty exhaustive calendar of family-type stuff to do in the area. And then, after you have looked at the Triangle Mom2Mom calendar, check out Play. It is a listing of fun things to do in the Triangle. Nice resources for Triangle folks. . .
Makes 4 servings. Ingredients2 large carrots1 teaspoon butter1 teaspoon brown sugar1/2 teaspoon cinnamonMethodClean and peel the carrots. Cut length-wise, then cut into half-moons about 1/4 inch wide.Put carrots into a microwave-safe bowl and cover. Microwave on medium-high heat for 2 minutes and stir to coat the carrots with the spices and now-melted butter. Replace cover and microwave on medium-high for another minute or so, until the carrots are tender. Stir and serve. Tips and notesThe mid-cooking stir in step two is optional but nice. If you have the oven on anyway, put all the ingredients in an oven-safe container, cover, and bake for about 20 minutes until the carrots are tender. Any temperature from 325 to 450 will be fine, with the carrots cooking a little slower or a little faster depending on the heat. Here's a quick tutorial for cooking dried beans. They are a frugal meal option that is really healthy. I found this recipe on Cooking for Good. It sounded great, so I thought I'd post it! Active time: about 35 minutes. Total time: about an hour. 1. Cake. Preheat oven to 375 degrees. Heat milk until it begins to steam, then add butter to hot milk. Butter will melt. (I microwave milk in a Pyrex measuring cup for about a minute and a half.) Grease and flour an 8” square pan or a muffin tin that holds a dozen muffins. From Real Simple online, by Sharon Tanenbaum and Ashley Tate. The hidden talents (both new and tried-and-true) of kitchen and bathroom staples. Have you heard about "Artisan Bread in Five Minutes a Day?" Mary Hunt's email blast today was about this book. Being the tightwad that I am and not wanting to spend $20 on a book about bread, I googled artisan bread in five minutes basic recipe which turned up this link: Simple Crusty Bread from the NY Times. It even gives the baking and storage directions. Then go here to see the Artisan Bread in Five Minutes website to see if you want to order the book. Mary Hunt's original post can be found here. I am going to try the bread after we eat the Homemade Wheat Bread that is rising in the Bread Maker right now. Directions Heat oven to 400 degrees. Coat a 3 quart round baking dish with nonstick spray. Heat oil in a large skillet over medium high heat. Add onion and saute 5 minutes. Add ground beef and taco seasoning and heat until no longer pink. Add tomatoes, beans, corn and enchilada sauce; bring to a simmer. Remove from heat. Put 1 tortilla in baking dish. Top with 1/5 of meat mixture (about 1 1/2 cups); sprinkle with 1/4 cup cheese. Repeat layers 4 more times. Cover with foil and bake 20 to 25 minutes until bubbly around edges and cheese is melted. Cool 5 minutes. Cut into wedges and serve with sour cream, if desired. Ingredients:1 (16-ounce) bag frozen pepper stir-fry blend (green, red and yellow peppers and onions) 1 cup plain yogurt 1 cup salsa 1 tablespoon butter, softened 8 (8-inch) flour tortillas 16 ounces, beef fajita strips, prepared 1 ½ cups mild cheddar cheese, shreddedDirections:Prepare the stir-fry pepper blend according to package directions. Mix yogurt and salsa. Set aside.Spread butter evenly on one side of each tortilla and layer cooked peppers and onions, fajita strips and cheese evenly on unbuttered side of four tortillas and cover with remaining tortillas, butter side up. Grill each quesadilla in large skillet over medium heat for 3 minutes on each side or until golden and cheese melts. Cut into wedges and serve with salsa dipping sauce.Makes 8 servings. How many of us have umpteen thousand WM or Target bags under the kitchen sink? 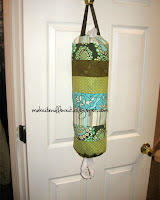 This is a cute and simple sewing project that uses scraps. Click here or on the photo to go to Make It and Love It. Combine flour, sugar, baking soda, cinnamon and salt in a large bowl; set aside. Mix together egg and apples; add to flour mixture. Stir in walnuts. Spread in a lightly greased 8"x8" baking pan. Bake at 350 degrees for 25 to 30 minutes, until a toothpick inserted near center comes out clean. Serve warm, drizzled with Caramel Sauce. Makes 9 servings. Combine brown sugar, flour and salt in a small saucepan. Gradually add water; stir until smooth. Cook and stir over medium heat until mixture comes to a boil. Cook for one to 2 minutes, until thickened. Remove from heat; stir in butter and vanilla. Have you seen KraftFoods new Budget Wise area? It includes videos, budget desserts, lunches, healthy living, message boards, and a whole lot more. Right now, if you are a member (it's free), you can print up to $50 in coupons for Kraft Products. Looking for a tasty alternative in wheat bread? Look no further that this link. As you will see, I am not a wheat bread girl, but this recipe changed my mind. One of our goals for this year is to choose a healthier lifestyle for the family . 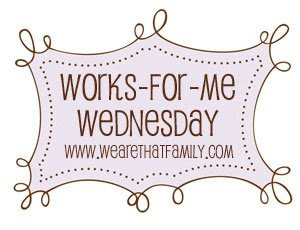 . . it works for us! I must admit that I am not a wheat bread girl. I love the non-nutritional "white stuff" and was very thankful to find a certain bread (whose initials are WW) that offers at least some healthy ingredients. Then I found this recipe. It is a great whole wheat alternative. This recipe produces a very soft and tasty product that I know you will enjoy. Put everything in the machine in the order listed and use the dough setting. After it beeps (1:40 for mine) I put it in a bread pan and let it rise for 30 min then bake it for 30-35 min in a 350 degree oven. Benefits include:- Less trips to the store -saving gas and time (which is especially important during this time in our economy)! Put all ingredients in a blender on high until smooth. Serve in a tall glass with a straw. The Sneaky Chef Immune-Booster Sorbet Makes 2 servings1 ½ cups frozen strawberries, blueberries, or cherries (without syrup or added sweeteners)1/2 cup store-bought pomegranate and/or blueberry juice1 teaspoon fresh squeezed lemon juice2 teaspoons sugar or honey, optionalPut all ingredients in a food processor and puree on high. Hold on tight, the first few seconds are a bit rough until the mixture smoothes out. If you like the idea combining your menu plan and grocery shopping list in one, but you don’t want to create a spreadsheet, here’s a simple blank one you can print. If you like the idea of combining your menu plan and grocery shopping list in one, but you don’t want to create a spreadsheet, here’s a simple blank one you can print. Great site at Small Notebook for a Simple Home. . .check it out! Spray crock well with cooking spray. In a mixing bowl, whip egg and milk together. Stir in spices.Add cheese and noodles, and stir well to combine. Pour the mixture into the crock pot. It will be very liquidy.Cover and cook on low for 2-5 hours, or on high for 1-3. After the first hour, stir well. Then stir every half hour or so until it is the consistency you like. Remember that it will continue to cook for a while after you turn it off, because the Crock Pot bowl holds heat really well. The cooking time will vary depending on what size crock pot you are using, and how quickly it heats and cooks.